Andrew Martin, President, I-Star Energy Solutions (www.irexcontracting.com), is a contractor specializing in energy savings, pipe insulation, and building envelope. He can be reached at andymartin@irexcorp.com. This university is investing in insulation to make a greener future for students. Energy efficiency and sustainability are important ideals for the leadership and student body at Temple University (Temple). Last year, Temple made the decision to make its campus more energy efficient and sent out request for proposals (RFPs) to 5 different energy service companies (ESCO), which are companies that focus on making changes that will enhance efficiency and save energy. After reviewing the proposals, Temple chose The Efficiency Network (TEN) to manage its energy-efficiency upgrade project, with a 3-year contract to manage ongoing improvements. TEN, as an ESCO, specializes in commercial buildings with a focus on higher education, and partners with clients to help bring greater energy efficiency to their facilities. In this project, Temple tasked TEN with finding projects that had a payback period under 5 years. Based on these parameters, TEN came back to Temple with a plan outlining measures to save energy, including insulation, lighting, HVAC equipment, and HVAC controls upgrades. Temple’s Energy Manager, Andrew Holden, who says that insulation has always been an issue of focus throughout his career, worked with an engineer to create a plan for insulating piping on steam and chilled-water systems, as he knows these systems to have a significant impact and a particularly fast return on investment (ROI). Speaking about the importance of insulating hot and cold systems, Holden said, “You only have to go into a steam room that isn’t insulated to know how important insulation really is.” Though mechanical insulation and its benefits are often overlooked, Holden affirms that it is “on everybody’s radar at this point.” Properly insulating these systems played an important role in reducing greenhouse gas (GHG) emissions, which is one of Temple’s established goals. Robert Tobin, the Senior Project Manager for TEN, oversaw and continues to manage this project for Temple. When asked what tend to be areas of focus for higher education, he said, “Insulation is one of the top picks for educational buildings” due to its quick payback period and relative ease of installation, and also for the significant energy savings it provides. 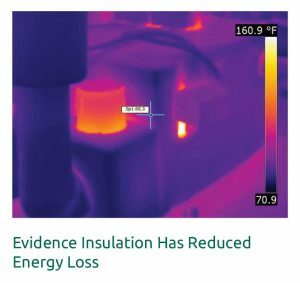 To outline the savings possible through insulation upgrades, TEN partnered with I-Star Energy Solutions (I-Star) to conduct a mechanical insulation assessment, which included buildings at the main campus and the health-science campus. Different types of buildings were evaluated in this assessment, including classrooms, research buildings, and a recreation center. The mechanical insulation assessment involves a full site walk where I-Star personnel perform a close evaluation of the current piping and equipment that could be insulated. The thermal performance of any uninsulated or under-insulated piping and equipment is then compared to that of a properly insulated system. The information from the site walk was then used by I-Star personnel to calculate energy savings based on the system operating parameters provided by the site engineers. I-Star also made use of infrared cameras to demonstrate where heat was currently being lost in the system. All the data was compiled into a report so that Temple could make an educated decision on the best way to conserve energy and save dollars. Step 1: I-Star met with TEN engineers at Temple to receive a list of buildings to be assessed and to learn of any areas of concern or current trouble spots. Their appraisers also reviewed the facility layouts and drawings to better determine the major sources of energy serving the buildings. Step 2: Physical walk-throughs of the buildings were completed to assess the high, medium, and low-pressure steam, steam condensate, heating hot water, chilled water, and domestic hot-water piping systems. A detailed take-off was created of any missing insulation on piping, valves, fittings, pumps, condensate receivers, air separators, chemical feeders, heat exchangers, and other equipment, which was then broken down by building area. 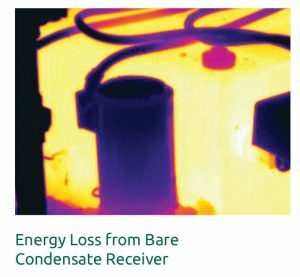 During the assessment, state-of-the-art infrared/digital photography was used to illustrate the energy loss throughout the mechanical systems. Step 3: With the use of 3E® Plus, a program developed by the North American Insulation Manufacturers Association (NAIMA) and endorsed by the Department of Energy, I-Star produced customized calculations on heat loss/gain and reductions in GHG emissions. Calculations were based on site conditions such as process temperatures, the hours of the mechanical systems, ambient air temperature around the uninsulated piping, fuel type/cost, and efficiency of the systems. All this criteria is entered into the 3E Plus program, which then indicates the heat loss/gain in MMBtus/dollars per one foot of uninsulated pipe. This data was then imported into I-Star’s proprietary software that joins the detailed field take-offs and the detailed 3E Plus calculations into one place. Step 4: The final report presented to TEN and Temple University showed energy savings, fuel cost savings, and environmental impact. The report was provided in 2 ways: first by building, and then by system. 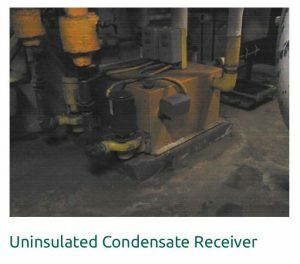 The high-/medium-pressure steam, steam condensate, and chilled-water systems were selected for insulation upgrades based upon payback criteria. Step 5: I-Star mobilized on site in July 2015 and began to insulate the mechanical systems based on the detailed scope created during the assessment phase. 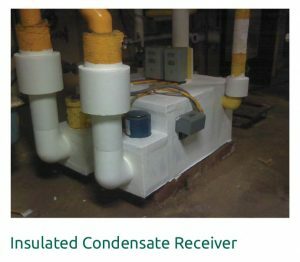 Fiber glass insulation with all-service jacketing (ASJ) was installed on piping, and PVC fitting covers and Insulation inserts were installed on elbows and other fittings. For ease of access for any maintenance issues, all flanged pairs, flanged valves, bonnets, and steam traps were fitted with removable/reusable insulation. The installation was completed in September 2015. Immediately after the insulation was installed, personnel noticed the ambient air temperature within the mechanical spaces dropped. TEN will be providing data that will measure the ongoing savings as well as the reductions in energy usage and GHG missions. 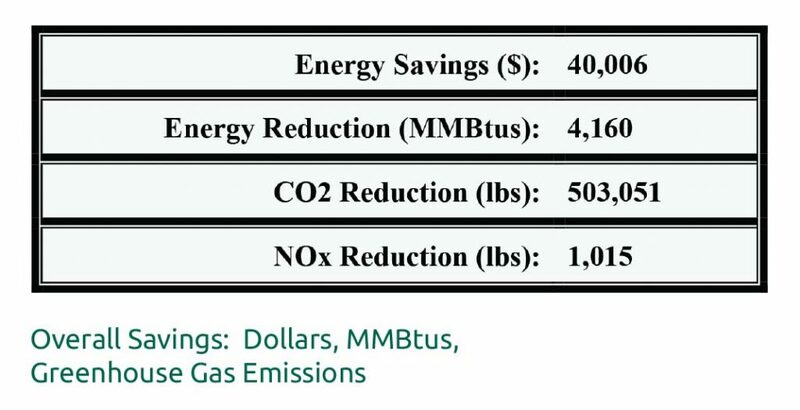 The reduction in energy consumption has a direct impact on the budget; as a result of the installed insulation, the annual energy cost savings for Temple University was projected to be $40,000. The chart below displays the projected savings in MMBtu/dollars, per system in the scope of work. Thus far, Holden said, work has been completed in 18 or 20 buildings, and there are at least 40 buildings to look at to see if similar upgrades can be made; Temple’s plan is to continue forward on this path. The excellent results yielded by the first mechanical insulation upgrades have been recognized as impactful—another benefit is that since mechanical rooms are “behind the scenes,” upgrades can be done without disturbing students and teachers. Tobin also added that the insulation work accomplished by I-Star was “top notch,” and that TEN hopes to continue to show similar energy savings with future improvements. This article was published in the April/May 2016 issue of Insulation Outlook magazine. Copyright © 2016 National Insulation Association. All rights reserved. The contents of this website and Insulation Outlook magazine may not be reproduced in any means, in whole or in part, without the prior written permission of the publisher and NIA. Any unauthorized duplication is strictly prohibited and would violate NIA’s copyright and may violate other copyright agreements that NIA has with authors and partners. Contact publisher@insulation.org to reprint or reproduce this content.